Musculoskeletal disorders are among the primary causes for worker absences. In order to sustainably reduce times absent due to sickness and disability, it is important to minimize the strain placed on workers’ bodies. Workers who continuously and repetitively lift and lower loads are especially prone to incorrect work posture that can lead to overexertion. Bending of the torso (below 800 mm) places a disproportionate strain on the human body. The electric case lifter literally takes the load off employees’ backs by doing the raising and lowering for them. It serves to bring workpieces into the correct grab area or to deliver finished products directly to floor rollers for further transport. 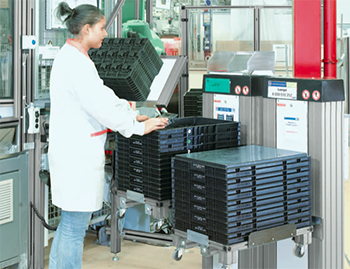 In particular where heavy loads are involved, the case lifter is a huge help in supplying materials to the workstation. It can also be positioned at the beginning or end of a conveyor track to feed or remove conveyed items. Moreover, it slashes the time required for parts supply and removal by up to 68% (MTM – Method of Time Measurement). Employees can then concentrate their efforts on their value-adding assembly work.